When I was very young, I read Exodus, a novel by Leon Uris. I realize that ‘serious’ literature people will scoff, because Uris’ style is somewhat florid…but that novel changed my life forever. I learned Hebrew because I wanted to speak the language of the nation of Israel…and I learned quite a bit about Judaism because my own Christian faith is based on Judaism. 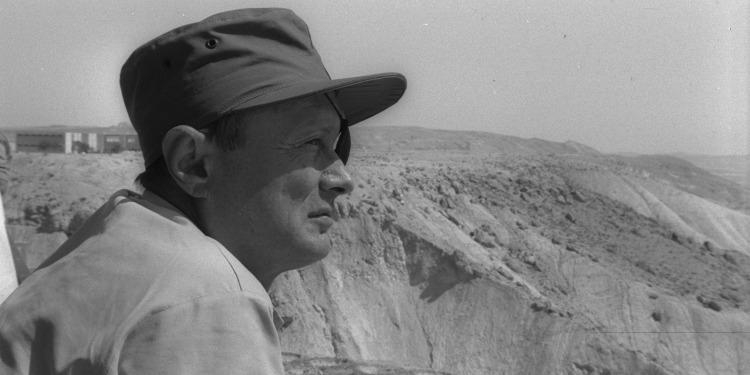 Anyway…one of my heroes growing up (and still) is Moshe Dayan. The following is a translation of a funeral oration he gave some sixty years ago, for Roi Rotberg, a young IDF officer who was murdered by terrorists from Gaza. Dayan’s words are eloquent…and as true then as they are still today. Yesterday with daybreak, Roi was murdered. The quiet of a spring morning blinded him, and he did not see the stalkers of his soul on the furrow. Let us not hurl blame at the murderers. Why should we complain of their hatred for us? Eight years have they sat in the refugee camps of Gaza, and seen, with their own eyes, how we have made a homeland of the soil and the villages where they and their forebears once dwelt. Not from the Arabs of Gaza must we demand the blood of Roi, but from ourselves. How our eyes are closed to the reality of our fate, unwilling to see the destiny of our generation in its full cruelty. Have we forgotten that this small band of youths, settled in Nahal Oz, carries on its shoulders the heavy gates of Gaza, beyond which hundreds of thousands of eyes and arms huddle together and pray for the onset of our weakness so that they may tear us to pieces — has this been forgotten? For we know that if the hope of our destruction is to perish, we must be, morning and evening, armed and ready. A generation of settlement are we, and without the steel helmet and the maw of the cannon we shall not plant a tree, nor build a house. Our children shall not have lives to live if we do not dig shelters; and without the barbed wire fence and the machine gun, we shall not pave a path nor drill for water. The millions of Jews, annihilated without a land, peer out at us from the ashes of Israeli history and command us to settle and rebuild a land for our people. But beyond the furrow that marks the border, lies a surging sea of hatred and vengeance, yearning for the day that the tranquility blunts our alertness, for the day that we heed the ambassadors of conspiring hypocrisy, who call for us to lay down our arms. It is to us that the blood of Roi calls from his shredded body. Although we have vowed a thousand vows that our blood will never again be shed in vain — yesterday we were once again seduced, brought to listen, to believe. Our reckoning with ourselves, we shall make today. We mustn’t flinch from the hatred that accompanies and fills the lives of hundreds of thousands of Arabs, who live around us and are waiting for the moment when their hands may claim our blood. We mustn’t avert our eyes, lest our hands be weakened. That is the decree of our generation. That is thechoice of our lives — to be willing and armed, strong and unyielding, lest the sword be knocked from our fists, and our lives severed. Roi Rotberg, the thin blond lad who left Tel Aviv in order to build his home alongside the gates of Gaza, to serve as our wall. Roi — the light in his heart blinded his eyes and he saw not the flash of the blade. The longing for peace deafened his ears and he heard not the sound of the coiled murderers. The gates of Gaza were too heavy for his shoulders, and they crushed him. ← Why Am I So Passionate About Advocating for My Daughter (Who Happens to be on the Autism Spectrum)? All I can say is wow! This brought tears to my eyes.